so that the next generation may know Christ. Welcome to the St. Paul’s Lutheran Church Web site. At St. Paul’s, we have been blessed to be able to offer meaningful ministry to many in our community and look forward to reaching out to our new neighbors and friends as well. 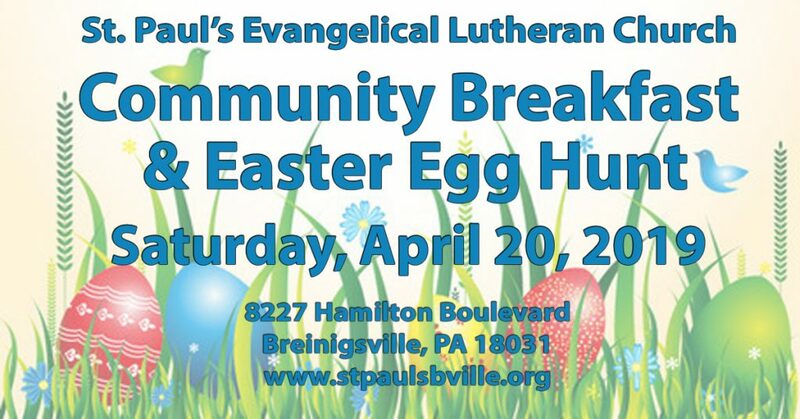 If you are new to the neighborhood or looking for a church grounded in the love and mission of Jesus Christ, I would like to invite you to come and experience worship at St. Paul’s Lutheran Church, Breinigsville. Our weekly worship is held each Sunday at 10:30AM and the sacrament of Holy Communion is offered weekly. St. Paul’s is a growing church which welcomes all people to come and learn and grow in faith. Educational opportunities are held for children and adults. Mission opportunities are available. Our musical program includes two handbell choirs, an adult choir and a children’s choir. We hope that as you browse this website, you will learn more about St. Paul’s. Please come and visit with us, as we would love to meet you in person. 10:30 AM service with Holy Communion every Sunday, including during the summer. 9:15 AM – classes for children ages 3 and older. Note: No Sunday School is held during June, July, and August. Sunday School resumes on September 10 at 9:15 AM. Visit our Kids Corner page for more information. St. Paul’s is located in Breinigsville at the corner of Weiler’s Road and Hamilton Boulevard – just outside Trexlertown. April 7th Potluck lunch and filling Easter eggs. April 18th Maundy Thursday Service at 7:00 p.m.
April 19th Good Friday Service at 10:30 a.m.
April 20th Breakfast 9:00 a.m. & Egg Hunt 10:00 a.m.0. April 20th Easter Vigil Service at 7:30 p.m.
April 21st Easter Sunday Service at 10:30 a.m. The congregation has donated to the Food Bank throughout the year but the needs of those less fortunate continue. So please continue to bring nonperishable food items along to worship. Each month we plan to feature a food item, but any item will be acceptable. Food Bank is currently in need of plastic shopping bags. THANK YOU to all who brought in macaroni & cheese during our March collection for the food bank. During April our “food of the month” will be canned soup & stews.